Obviously, the fact that Obama's amnesty will screw American workers isn't something the establishment or their helpers want to discuss. So, the reader is urged to go to public appearances or even web chats involving politicians and reporters, and ask variants of the question below. See the Question Authority page for more information on the process, and see the recent posts on the DREAM Act page for more information on Obama's amnesty. Note that most of those harmed by Obama's amnesty will be Democrats. A text version of the chat is below, together with screen grabs. "GFR" means Garance Franke Ruta. Also below are a few statements I made in response to statements she made, that she didn't post or respond to. 24Ahead: Will those (temporarily-legalized) former illegal aliens covered by DACA be able to compete with struggling American citizens for any job that those former illegal aliens are qualified for? That is, as an illegal alien, someone can only do certain jobs like picking crops. But, when they're in DACA, can't they do any job they're qualified for, such as federal construction projects, working in an office, etc.? Do you agree that because of that, those (temporarily-legalized) former illegal aliens who are covered by DACA will be able to compete with struggling American citizens for any job that those former illegal aliens are qualified for? GFR: The DACA -- Deferred Action for Childhood Arrivals -- work provision makes it possible for undocumented young people brought to this country as children to apply for a two-year work permit. After that, they can apply to work legally anywhere they can get hired. 24Ahead: Right, but my point is that DACA allows former illegal aliens to compete with struggling Americans. Illegal aliens can't compete with Americans for, say, federal construction jobs. Under DACA however, former illegal aliens can compete with struggling Americans for those jobs. Will you admit that's true? I.e., that DACA provides competition for struggling Americans that didn't exist before. GFR: The whole point of the law is to make it possible for undocumented young people to be able to work or study without fear of deportation for at least two years. Most undocumented people are already working or going to school -- one major reason people come to the U.S. illegally is because they DO find themselves able to work here and to make more money than they can at home. Or at least that was the case before the downturn. GFR: Migration has slowed markedly in recent years and fewer Mexicans are entering the U.S. now. GFR: The theory behind the measure is that DACA-covered kids are in a uniquely awkward cultural position and it seems cruel to send someone to a country they've never lived in and where they may not even speak the language based entirely on their parent's actions. 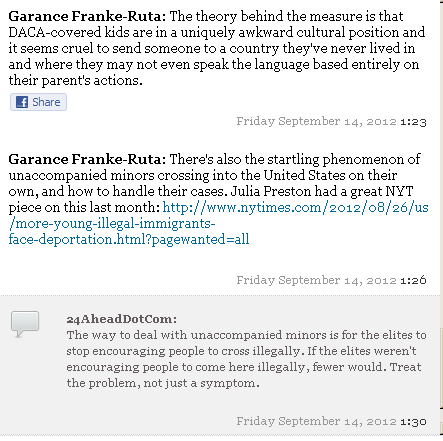 24Ahead: The way to deal with unaccompanied minors is for the elites to stop encouraging people to cross illegally. If the elites weren't encouraging people to come here illegally, fewer would. Treat the problem, not just a symptom. GFR: I appreciate you have strong views on this topic. I am wondering if anyone else has any questions? "Thank you for stopping by...."
You're still evading the point. 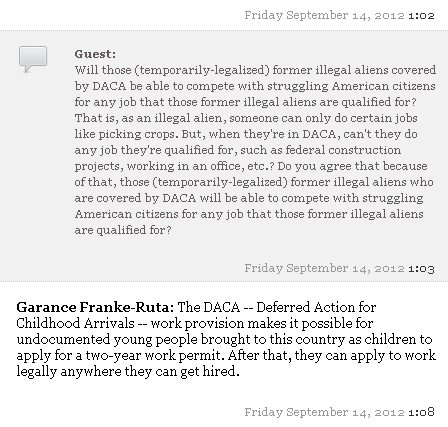 Almost 3 months ago, I pointed out that it doesn't matter that those who'd be covered by DACA are already working: https://24ahead.com/n/11019 Because of DACA, those who were here illegally can compete in job types they couldn't before: fed. construction, office jobs, bank jobs, etc. Will you finally admit that's the case? Will you finally admit that that DACA provides competition for struggling Americans that didn't exist before? Your "theory" is just self-serving blather that those who want to profit from the DACA eligible use. DACA will harm not just struggling U.S. workers and college students, it will harm struggling Third World countries that need all the smart people they can hold on to. Once again: please get out there and challenge the elites, whether in web chats, on Twitter, or in person. Make them discuss the things they obviously do not want to discuss.